Nearly all travelers have experiences that stand out among all others as a favorite. Mine seems to change each time I go somewhere new, but the opportunity to be present as a new country achieved its first-ever World Cup Soccer Finals berth is something I will cherish for a long time. I absolutely love international sport because the environment is so much better than I’ve experienced at American sporting events. The sport experience in Europe is still dominated by Joe Fan, and the teams are woven deeply in the fabric of the local communities. To be sure, clubs are still a business, but the economics are constructed differently, so the stadiums have a better chance of being fully populated by singing, eating, drinking, and most importantly, bonding of the members of the community. Equally as important is that the visiting teams always have ‘their’ own section, and going on the road with the club is as traditional as Weihnachtsmarkt in Bavaria during the Holidays. At the international level, there are over 300 countries competing for attention on the world sport stage. Many sports are regional, and each country seems to have its one or two sports where it does well. But no sport is more international, and more loved by Joe Fan, than soccer. It is the one sport that brings out national pride more than any other. So, when ten-year-old Slovenia had the opportunity to gain its first World Cup berth against favored Romania in a two-leg playoff, I knew the tiny Alpine country was going to have the party of its life… win or lose. And so, I planned my travels around being in Ljubljana when the first leg was to be played, with the hopes of getting in. And yes, thankfully, I was able to get a ticket. 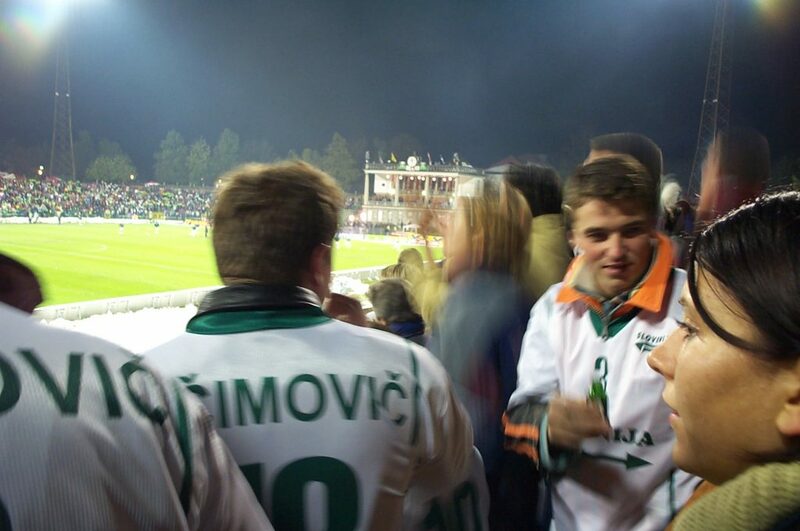 Ljubljana’s Stadion was tiny and simple by international standards. It seated about 10,000 around a simple oval with a grandstand, a really old-fashioned manual scoreboard, and a stadium clock that didn’t work (Slovenia has long since moved to a more suitable national stadium). Above the seats was a walkway where pretzel and beer vendors hawked their wares from simple carts and the standing crowd (including me) congregated. Security was tight throughout the park, and the Slovene police wore fully body armor, but they left people alone. 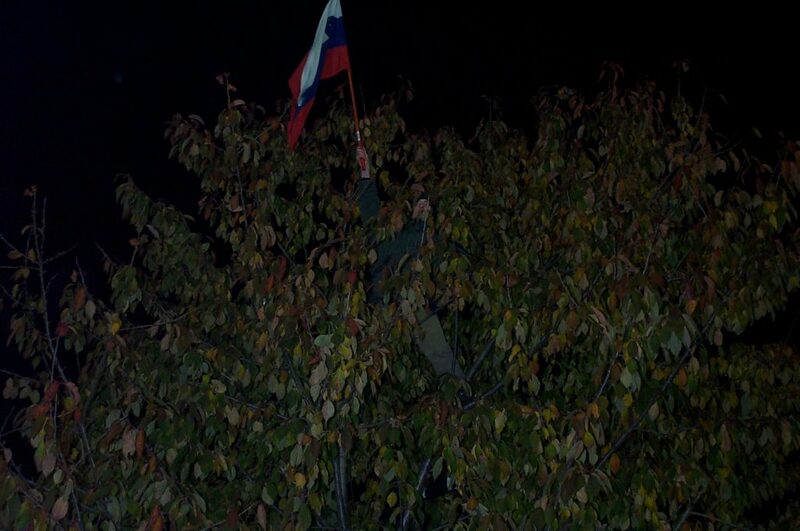 For example, the fan in the picture below climbed this tree outside the stadium so he could wave the Slovenian flag… they let him stay there for the full two hours before the game, but once it started they made him come down. The blue, yellow, and red colors in the section directly across from me marked the area reserved for Romanian fans, who bussed in from Bucharest. 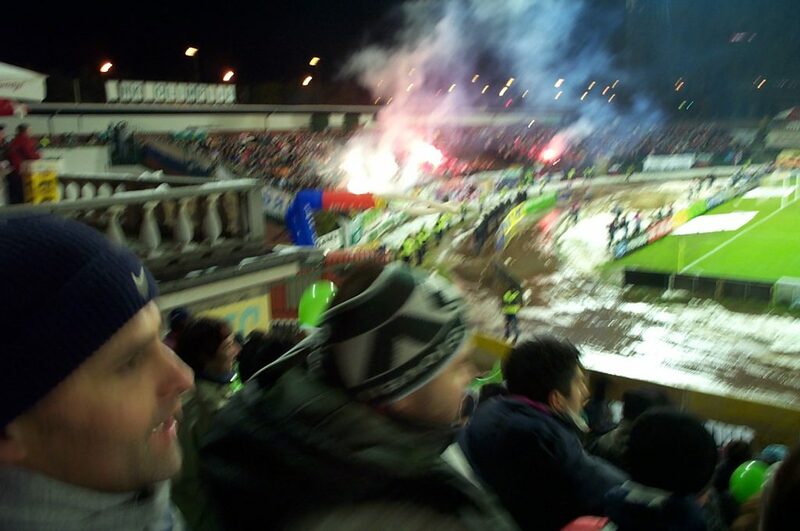 These fans had their own entrance reserved to ensure minimal opportunity for scuffling with the home supporters, a well-known problem in world soccer. But there were no incidents of that variety apart from the occasional snowball being thrown between the sections — the greater number of snowballs were reserved for the general direction of the far side linesman, who the fans felt called Slovenia offside a little too often. International matches are very ceremonial. The teams walk out together in column, and a band plays the two national anthems. The Slovenes cacophonically belted out their national anthem, waved flags or antifreeze green SLOVENIJA banners passed out before the game by the national telecom corporation (they also passed out antifreeze green balloons). I bought a scarf from another vendor for about $5… it is the scarf pictured at the top of this story. The game itself started badly for the home side. Romania (in yellow) opened the game with the majority of the possession, and pressed the obviously overmatched and nervous Slovenes constantly. The home side seemed content to defend until they could regroup, and Romania was frustrated and unable to muster a good shot on net. However, in the 26th minute Romania broke through on a fluky, scrappy goal that left the crowd stunned and silent. But only momentarily. It seemed like the Slovenes woke up after that and began playing more aggressively. Their efforts were quickly rewarded when after ten minutes of controlling the play, a well-struck 42nd-minute header levelled the score. It was pandemonium. I took the above picture during the celebrations where the crowd was dancing, singing, lighting flares with smoke so thick you couldn’t see the pitch! It’s fuzzy because I was being jostled like crazy, and it stayed that way all the way to halftime. The second half was more of the same. Romania, surprised to be at 1-1, tried to step up the pace to regain the lead, but Slovenia’s defense gained confidence and kept the visitors clear of the goal area. Romania’s strikers showed poor form, and rarely put their shots on net. Yet, Slovenia showed almost no success on offense. Then the breakthrough occurred. 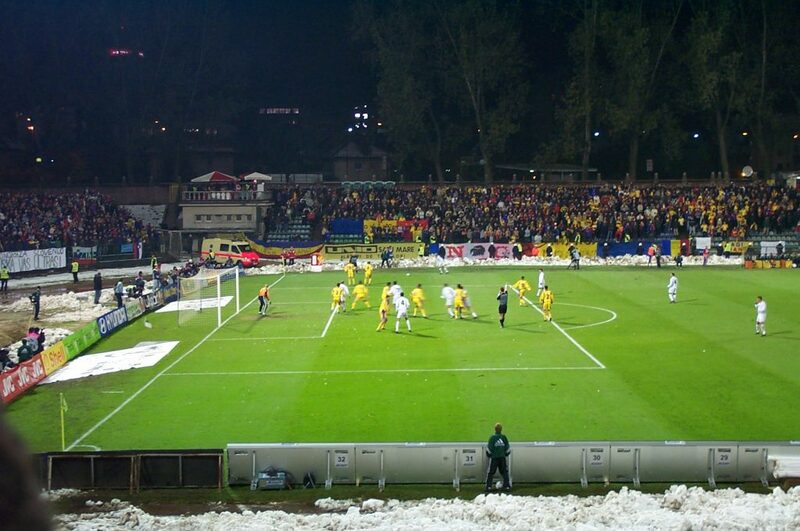 A Romanian striker took advantage of a terrible defensive throw-in and went in alone on goal in the 68th minute. The Slovene goalie charged out to challenge. The shot went right into the goalie’s chest and he smothered it. With the crowd still cheering, the ball went immediately downfield where it was played on a high bounce deep in Romanian territory. From a bad angle, a Slovene striker sails a looping shot that went over the goalie’s head and into the side netting. Just like that, the home side had gone up 2-1, sending the 10,000-plus into complete delirium. And so, on Wednesday night, when the second leg was played in Bucharest, I watched with great interest. My new Slovenija scarf was wrapped around my neck, and I cheered and cringed with the flow of the game as if it were USA playing. It ended 1-1, meaning that Slovenia advanced to the World Cup on aggregate, 3-2. It is a great feeling to have been able to watch a little slice of sports history being made. Unfortunately, Slovenia did not fare well in the 2002 World Cup Finals themselves, getting soundly beaten in all three of their preliminary matches. But just making the World Cup Finals was a long, grueling effort. For the young nation of Slovenia whose freedom was barely a decade old at the time, the journey to the Finals was a wonderful thing to behold.